new book: RA News: DJ History compile Boy's Own book - DJ History will release Boy's Own - The Complete Fanzines 1986-92 in October 2009. Music festival in Austin, Texas: Fun Fun Fun Festival: My Old Kentucky Blog: Full Lineup Announcement : Fun Fun Fun Fest : Nov. 7-8 : Austin, TX : a music blog that parties with unicorns. Hyperdub compilation: RA News: Hyperdub finalise 5 - Hyperdub will release 5: Five Years Of Low End Contagion on October 19th, 2009. He's one of the most beloved—and hated—producers in minimal today. RA's Ryan Keeling chats to Ali Shirazinia about Twitter, his upcoming show at Berghain and whether Deep Dish will ever get back together. mix compilation: RA News: Will Saul mixes Balance 15 - Eq will release Balance 015 on October 19th 2009. 2009 album: RA News: Boys Noize unleashes Power - Last Gang will release Boys Noize's Power on October 6, 2009 in North America. 2009 album: RA News: Estroe preps Elemental Assets - Connaisseur will release Elemental Assets on November 6th, 2009. Warp Records will release Butter on October 12th, 2009.
interview: RA: Under the gun: Trevor Jackson - Interview - RA peers into the box of the ex-Output Records label boss. Ghost Box will release the debut album by Roj on September 28. Entitled The Transactional Dharma of Roj, it's the work of Roj Stevens, a former member of Warp-signed Broadcast. Italian metallers SLOWMOTION APOCALYPSE will release their third album, "Mothra", this fall via Scarlet Records. 2009 album: Gothtronic | News: VELVET ACID CHRIST Returns with The Art of Breaking Apart - Released on Metropolis and available October 27, 2009.
academic music blogger: Deleting Music on the shortcomings of digital music culture and the attitudes of major labels. Our Bestival cover CD comes courtesy of fun time festival man, Rob da Bank. True to form Mr. Bank has compiled a range of party starting tunes from Underworld, Animal Collective, MGMT, Zomby, Feadz, DJ Zinc and Passion Pit. Tobi Neumann and Onur Özer are set to compile the second edition of Cocoon's Green & Blue mix series. Cocoon will release Green & Blue: Tobi Neumann and Onur Özer on September 11th, 2009. Eivind Aarset is like a shy musical Jedi Knight. The force is strong in him, obviously, for his guitar has played a major part in sculpting a lot of the most important music to come out of Norway in the past ten- to fifteen years. He is an experimental jazz maestro, yet a reclusive one. The four records he has released in his own name are something like elusive masterpieces; darkish, timeless things that live their lives without neon signs and advertisements. The first 4 tunes in the playlist is from the new record STERNA PARADISEA, to be released August 24th 2009. Danish metallers BLACK WREATH have inked a deal with Norway's Head Not Found for the release of their debut album, "A Pyre Of Lost Dreams". album reviewed: Uncut.co.uk | Wild Mercury Sound - Post details: Califone: "All My Friends Are Funeral Singers"
Swedish black metallers Dark Funeral are currently holed up in Abyss Studio with producer Peter Tägtgren (Hypocrisy) recording their as-yet-untitled new full-length, scheduled for release in November via Regain Records. BPitch will release Fuckpony's Let The Love Flow on October 26, 2009.
interview: RA: Richie Hawtin: Riding the wave - Interview. He's the biggest name in minimal, but he claims that he may be on the way down. We talk to the Minus boss in advance of his appearance at this year's Electric Zoo about hype, Plastikman and much more. 2009 album: Portal - Complete Work On New Album - Metal Storm - Look for "Swarth" to be released officially October 20th. Delsin will release Redshape's The Dance Paradox in October 2009. Virginia-based down-tempo punishing doom metal act SALOME will release its sophomore full-length album via Profound Lore Records. MIC Norway: Susanna And The Magical Orchestra: 3 - Strong reviews for Susanna And The Magical Orchestra’s latest album. TROLL — the Norwegian black metal band founded in 1992 by Stian Arnesen (a.k.a. Nagash; a.k.a. Lex Icon of THE KOVENANT) — has inked a deal with Napalm Records. The group's new album is scheduled for release in the winter. Hope Recordings will release Way Out West's We Love Machine on October 5th 2009. New Superfamily track on myspace - The songs of the weak will die - this band just keep getting better and better - the production is stellar, the interesting arrangements, the addictive quality of their tracks - new track: riyl: A-ha, Mew and New Order. I will say it again, Superfamily are one of the best melodic pop-rock bands in Europe at the mo. + More artists to be announced during August. Barrow formed Beak> earlier this year with two fellow Bristol musicians, Billy Fuller and Matt Williams. The band already has an album ready to go. Their self-titled debut will be out October 19 in the UK on Barrow's own Invada, and Ipecac will release it the next day in the US. Gwynbleidd’s much-anticipated debut album, Nostalgia, is set for an October 27 release on BlackCurrant Music. Dekmantel will release Juju & Jordash on September 21st, 2009. "Night Is The New Day", the eighth studio album from Swedish masters of melancholy KATATONIA, has had its release date pushed back to November 2 in Europe and November 10 in North America via Peaceville Records. Cocoon will release Phil Kieran's Shh on September 21, 2009. Nacho Patrol Presents Africa Jet Band will be released on September 15. 2009 album: RA News: Linkwood presents his System - Prime Numbers will release Linkwood's System on September 28, 2009. If you're still into CDs, you'll have to travel to London's Rough Trade shop to pick up Seek Magic because that's the only place on earth selling it on compact disc. UPDATE: The Rough Trade version is out this coming Monday, August 24, and it comes with a bonus disc featuring a 30-minute instrumental. Get Physical Music will release II on October 23rd, 2009. 2009 album: Hydra Head Records: Pyramids With Nadja: Full Length Collaboration out October 27th on Hydra Head! Lastly, RJ announced he's been working on his fourth full-length album, though it is most likely not going to be out until Spring of 2010, but you never know. Perlon will release Shackleton's Three EPs on October 12th, 2009..
first review: David Sylvian | Albums - Manafon | davidsylvian.net :: Expect Everything and Nothing less! Way Out West is preparing to release its fourth studio album, We Love Machine, Oct. 5 on Hope Recordings. micro interview from this DFA signed band Dazed Digital | Holy Ghost! Recommends - note the 2010 debut album ! Their new single 'I Will Come Back' as remixed by Classixx and DJ Mehdi is out now, whilst their debut album will be released early next year. 2009 album: RA News: Jori Hulkkonen is a man from Earth - Turbo will release Jori Hulkkonen's Man from Earth in October. 2009 album: Taxi Taxi! confirm debut full-length | NEWS | ITSATRAP2009 - Taxi Taxi! 's debut full-length "Still Standing at Your Back Door" is confirmed for release on September 21. Community Projects will release Tribe Rebirth on October 6th, with an iTunes pre-release scheduled for August 25th. September festivals: RA: Top 10 September 2009 festivals - RA picks the September festival highlights from across the globe. RA's Nick Sylvester chats to the LCD Soundsystem frontman and disco DJ in advance of his performance at this year's Electric Zoo festival. 2009 album: RA News: Todd Bodine announces Forms - Highgrade Records will release Todd Bodine's Forms on October 26, 2009. As many of you know by now, Converge will be releasing their long-awaited new studio album, "Axe To Fall," on October 20th via Epitaph Records (with vinyl to be issued by Deathwish Inc.). London, U.K.-based progressive extreme metal band DE PROFUNDIS has set "A Bleak Reflection" as the title of its second album, tentatively due before the end of the year. Norwegian avant-garde metal band DEVAR will release its debut album, "Alternate Endings", on September 29 via Code666 Records. James Plotkin (Khanate, etc. ), Aaron Turner (Isis, etc. ), and Tim Wyskida (Khanate) have teamed up to launch a new project called Jodis. The group's new album, "Secret House," will hit streets on October 27th via Hydra Head Records. THESE ARE THEY — a Chicago-based death metal band featuring vocalist Paul Kuhr (NOVEMBERS DOOM), guitarist Steve Nicholson (ex-NOVEMBERS DOOM), bassist Wiley Wells (EARTHEN) and drummer Sasha Horn (TRIALS) — will release its full-length debut, "Who Linger", on November 10 via The End Records. Wandering will release Sven Weisemann's Xine on October 12th, 2009. British music magazines in a sales slump, hardly surprising when the content is so poor, lack of agenda, complacency, little evidence of creativity. Uncut got what they deserved declining sales ! that magazine is so lacking in creativity and needs to radically change with a new direction / and re-launch. Meanwhile both Kerrang and NME continue to loose sales, both are victims of chasing narrow teenager youth demographics, Kerrang continues to serve up mallcore rock tripe and the NME is struggling to re-invent itself after slowly realising that landfill indie is a culturally dead end cul de sac. now the NME is nearly at the sales levels of when the weekly Sounds magazine closed in 1991.
pHinnWeb now also using tumblr - pHinnWeb: Finnish electronic music info since 1996. NRK Music will release The Lab 02: Steve Bug on September 27th, 2009. Mothership will release Italoboyz's Bla Bla Bla on September 28, 2009. Philadelphian behemoth JAVELINA will release its sophomore album on September 29 via Translation Loss Records. Cadenza will release Tribute To The Sun on October 12th, 2009. The Mary Onettes have announced that their new album "Islands" will be released on November 4. Peter Andersson reports that he his finished with the next Raison d'Etre album and it will be called "The stains of the embodied sacrifice". No official release date yet, but he says to expect it in about two months via Cold Meat Industry. 2020 Vision will release 2020 Soundsystem's Falling on September 21, 2009. 2009 album: RA News: Variant preps The Setting Sun - Echospace will release Variant's The Setting Sun on August 18th, 2009. 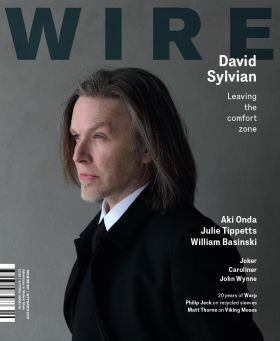 New issue of The Wire features David Sylvian on the front cover. Versus Grain, Cloaks' debut LP, was released last month on their own 3by3 label, following the 'Against'/'Rust on Metal' 12" that preceded it. Digital release happened last week along with a second 12", 'Junk'/'R.F.I.D', but alas, there's no plans for a vinyl edition of the album. After a 14-year stretch of releasing only live albums, the duo of Hans-Joachim Roedelius and Dieter Mobius — more succinctly known as Cluster — has emerged from Tim Story’s Ohio studio with another Cluster classic, Qua. Lot49 will release Lee Coombs' Light and Dark on October 12, 2009. San Francisco Bay Area progressive extreme metallers CORMORANT have unveiled the stunning artwork for their upcoming full-length album, "Metazoa", which is due out on September 22, 2009 . Dinky's Anemik will be released on October 5, 2009 via Wagon Repair. 2009 album: Esplendor Geometrico gets the Pulsión on new album - be released on Geometrik and available from September 10th. Ethernet signed to the kranky label, listen to a track: Pitchfork: Forkcast: Ethernet: "Kansai"
California-based electronic artist Tim Gray wrote his master thesis on the use of sound for control, healing and empowerment. Going by the name Ethernet, he's releasing a new album via Kranky, due out October 5th that mix electronics with field recordings from Japan and Northern California. new track: Pitchfork: Forkcast: Glass Candy: "Geto Boys"
A new INSOMNIUM track entitled "Where The Last Wave Broke" is available for streaming on the band's MySpace page. We are a transatlantic pop combo based in London and New York City.Our new album, Villainess, is released on September 1st 2009 and features guest appearances by Little Annie, Isabelle Antena, Kim Field and Rebecca Chamberlain. 2010 return? FACT magazine: - The return of Plastikman? Monday: Mondays from 9.00 to 10.00pm will become the home of the very best in music documentaries. Nihal hosting a four-way battle of wits and fury as a journalist, a musician and a DJ discuss the qualities (or lack of) of the biggest records, films and games released that week in Radio 1's new review programme. Wednesday: On Wednesdays (9.00-10.00pm) Huw Stephens heads off on a weekly audio adventure to the boundaries of new musical experimentation to find the most remarkable sounds that producers, DJs, bands, shops, websites and in-boxes have to offer. Thursday: In New DJs We Trust becomes a permanent fixture in the 9.00 to 10.00pm slot on Thursdays with the impressive roster of rising stars Jaymo & Andy George, Heidi, Alex Metric, and Toddla T bringing the freshest club music to Radio 1. Friday: Friday evenings remain the home of dance but Pete Tong and Annie Mac are flipping shows – so Annie's Mash-Up will kick start the weekend from 7.00 to 9.00pm and Pete Tong is on the decks between 9.00 and 11.00pm. The schedule changes come into effect on Monday 21 September 2009. Listen again to the first installment of Orbital's 6 Mix residency, with the techno legends playing the tunes that inspired them, and an exclusive electro mix from Phil Hartnoll. Do you think you know EVERYTHING about Black Metal? Terrorizer Magazine Presents The Secret History of... Black Metal. Terrorizer, the World's most authoritative Extreme Music and Heavy Metal magazine proudly presents the first ever issue of its Secret Histories.This is a current magazine, not a back issue, and is onsale in the UK from 13 August 2009. 100 packed pages, including Mayhem, Immortal, Watain, Darkthrone and more, exclusive interviews, scene repots and in-depth features on music's most dangerous genre. Terrorizer staff choose the 40 Black Metal Albums YOU MUST HEAR! Free CD! with tracks from BEHERIT, DARKTHRONE, AURA NOIR, CHTHONIC and more! This magaizne is released in the UK on 13 August 2009 and this is your opportunity to buy this magazine direct from the Publisher and have it delivered to your door for £5.99 in the UK, £6.99 in the EU and £7.99 across the rest of the world. Part one of Clash’s twentieth anniversary celebrations. We dig into our archives for classic Aphex Twin and Boards Of Canada, plus a new chat with Chris Clark. New Weird Australia. - Eclectic & experimental Australian Music. Experimental Music festival: avantgarde festival Schiphost/Germany - avantgarde and experimental music festival - The Avantgarde Festival in Schiphorst near Hamburg is the biggest live event for experimental music in Western Europe. Röyksopp will be performing at Norway's Insomnia Festival Insomniafestival - News - The legendary Tromsø electronic duo is ready to play their first live concert in their hometown on September 26! Hyperdub label compilation to be released in October RA News: Hyperdub announce 5 Years of Low End Contagion - Hyperdub will release 5 Years of Low End Contagion in October 2009. The new issue of NME, on sale across the UK on Wednesday 5 August (and in London a day earlier), is a Future 50 special, featuring the 50 acts pushing things forward in 2009. Broadcast have announced details of their new EP which is due out around October time on Warp Records. news update: Catamenia - New Album Title Revealed - Metal Storm - titled "Cavalcade"
2010 plans: Dark Fortress - Begin Recording New Album - Metal Storm - is scheduled to be released in early 2010 via Century Media Records. mp3 track: Pitchfork: Forkcast: Dungen: "Samtidigt"
Norwegian avant-garde metallers RAM-ZET have posted two new songs — "Infamia" and "I Am Dirt" — on their MySpace page. Both cuts will appear on the band's fourth album, "Neutralized", which is scheduled for release on October 12 via Ascendance Records. Andrew Weatherall will release his debut solo album, A Pox On The Pioneers, on September 21. Norwegian metallers BORKNAGAR and IN VAIN have both had the release dates of their new albums — "Universal" and "Mantra", respectively — pushed back to 2010. Another very poor issue of Uncut magazine, nothing appealing on the front cover whatsoever - boring Beatles once again are the main feature. Uncut have been going through a barren patch in 2009, it will interesting to see how many sales they have lost when the next audited sales figures are released. You should know by now that the new NME editor is Krissi Murison: Krissi Murison to edit NME | Media | guardian.co.uk - she takes over on September 1st. If only the NME would ditch British landill indie, tell Oasis to f-off, and ignore Pete Doherty - then maybe things could begin to improve. IMHO the content is still rather busy, there are improved top and bottom navigation sections, with content clustered into sections. Denmark's Strøm Festival have just unveiled the full line-up and schedule for their six-day festival this August. CD, LP and Music DVD (not film DVDs) Reviews, as they appeared in this month's paper print issue of the MOJO magazine, almost alphabetical. The School of Performance and Cultural Industries is pleased to be hosting a one-day conference event on Wedensday, 9th September entitled “Post-Punk Performance: the alternative 80s in Britain”. The Dummy guide to Rinse FM 11 things you need to know about the most important radio station in Britain. Surely if the BBC remit is to provide services to all sections of the community, then the ignorant Tories are telling the youth you don't matter, culture isn't important. We will offload it to a private company to make money out of you, mainstreaming the music even more and providing less choice and diversity. NEVER trust the Tories or commercial radio companies ! The Munich-based Prologue has stormed out of the gates in 2009 with a heady collection of deep, trancey techno. It will only get better from here. Stefan has updated his stats analysis of the best reviewed albums of 2009: Acclaimed Music Forum: UPDATE 31/07/09 : MEGA-CRITIC : Best Reviewed Albums Of 2009 So Far - Animal Collective still at number 1.